Currently low-wage workers who are paid a salary and work overtime do not have the same protections as workers who are at the same earnings level but paid on an hourly basis. Specifically, under Fair Labor Standards Act (FLSA) overtime work protections, all hourly workers must be paid at least “time-and-a-half,” or 1.5 times their regular pay rate, for each hour of work per week beyond 40 hours. Only salaried workers making below $455 per week (equivalent to $23,660 per year) qualify for the same automatic protections. Salaried workers making $455 a week or more only have the right to earn overtime pay if their duties are determined to be nonexempt duties. This means that employees who make as little as $23,660 per year may have no limit on their weekly work hours nor earn any pay for working beyond the standard 40-hour workweek. In this time of stagnant wages despite rising labor productivity, slow economic recovery of household purchasing power, and increasing income inequality, proposals to include low-salary workers in overtime (OT) coverage by lifting the salary threshold to at least $50,000 are timely. Some of the debate over raising the threshold hinges on the idea that salaried workers newly eligible for overtime pay would become more like hourly workers because their employers would need to track these workers’ hours. Thus, it would be useful to see how similar salaried workers in the targeted pay ranges are to their hourly paid counterparts in terms of work schedule flexibility, frequency of overtime, and levels of work-family conflict and work stress. Specifically, given concerns that extending automatic OT protection to these low-salaried workers would “hurt the very people it is intended to help,” we examine whether salaried workers stand to lose flexibility by gaining OT protections. Using data from the General Social Survey (GSS),1 this report looks at workers in different pay brackets and explores the relationship between pay status (being paid on a salary basis or an hourly basis), work flexibility (being able to vary one’s starting and ending times, to take time off during the work day for personal or family matters, and to refuse requests to work overtime work) and outcomes such as work-family conflict and work stress. From the GSS we use pay brackets that most closely approximate the existing and proposed OT-protection eligibility thresholds. There is a notion that salaried workers have more flexibility at work than their hourly counterparts. This is not the case at the pay levels that would be covered by an increase in the OT threshold. In general, salaried workers at the lower (less than $50,000) income levels don’t have noticeably greater levels of work flexibility that they would “lose” if they became more like their hourly counterparts. Hourly workers paid at least $22,500 but less than $50,000 have slightly less ability to adjust their starting and ending times, but the differences, while not trivial, are not large enough to constitute a serious loss of flexibility among such workers. There is therefore little danger that effectively “converting” salaried workers paid up to $50,000 to hourly status by raising the overtime pay threshold to $50,000 would markedly reduce their work scheduling flexibility. Generally it is the salaried workers much higher up the pay distribution who have a lot more flexibility to vary their start and end times and these workers will not be affected by an increase of the OT pay threshold to the modest levels discussed here. Contrary to a common assumption, salaried workers at the affected pay levels appear to have no more ability to take time off for personal or family matters than do hourly workers at the same annual earnings levels. Thus, effectively “switching” employees from salaried to hourly by requiring employers to track their hours for purposes of overtime pay would not reduce, and might even increase, this important element of work flexibility. If we consider mandatory overtime to be an indicator of inflexibility in one’s work schedule, salaried workers have about the same or even greater likelihood of having to work mandatory overtime than hourly workers in the same pay brackets affected by an increase in the threshold. Thus a shift in the OT threshold would if anything provide the newly eligible workers with greater flexibility to refuse overtime work. Salaried workers at the affected pay levels either report greater work-family conflict and work stress or report greater incidence of the conditions (such as mandatory overtime work) associated with such conflict and stress. Thus in terms of outcomes they have little to lose and in fact something to gain from falling within new OT thresholds. Because the salaried work force starts out with higher work-family conflict, a de facto reclassification as hourly might slightly reduce their work-family conflict. Levels of work stress are slightly higher among salaried workers than hourly workers, thus work stress would likely not increase. While working irregular shifts is a condition associated with greater work-family conflict (generally and for salaried workers), transforming salaried workers above $22,500 into hourly workers does not threaten to make these workers’ schedules any more irregular. Because salaried workers in the affected pay brackets already work mandatory overtime at the same frequency as hourly workers and more days of overtime in general than hourly workers, raising the overtime threshold for them would not increase and in fact could decrease the work stress and work-family conflict associated with mandatory overtime. Finally, to the extent that the policy leads employers to curb overtime, this could create work hours for the underemployed workers who need them (a topic to be explored further in an upcoming EPI report). Under current overtime provisions, all hourly workers are eligible for overtime premium pay (time and a half), but only salaried workers earning less than $455 a week automatically get overtime protection. Salaried workers who earn $455 a week or more are only automatically due overtime pay if their “primary” duties are not exempt duties such as being supervisory, managerial, administrative or professional duties (Shierholz 2014). While the salary minimum was adjusted upwards to $455 in 2004, the “duties test” to qualify an employee as exempt (i.e., not automatically eligible for overtime pay) became less clear and likely more expansive. Taken together, this means employees who are paid as little as $23,660 annually are not entitled to additional pay when they work over 40 hours in a given week, when many if not most of their job tasks are similar to those of the hourly paid, nonexempt workforce. 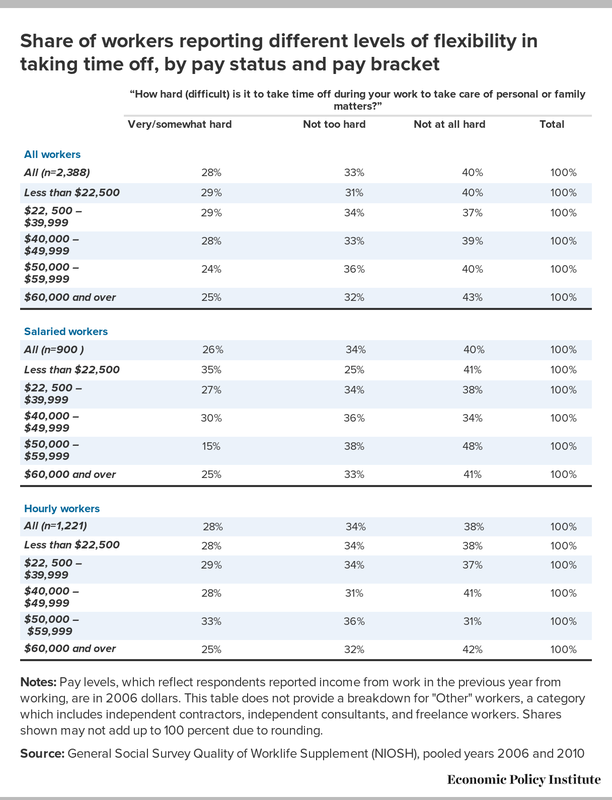 The General Social Survey (GSS) asks respondents about their own (and family) annual income, by bracket. Specifically, the biannual GSS asks respondents to report the income in the previous year from working, commonly known as “wages” or “pay.” In the GSS data, the pay level cutoff closest to the current $23,660 annualized pay threshold for overtime protection ($455 per week times 52 weeks) is $22,500. Thus we will compare those below and above that level. The next higher brackets will be combined to formulate two additional pay brackets, $22,500 to $39,999, and $40,000 to $49,999.7 These conform closest to the salary levels to which coverage gradually would be granted under the Senate proposal and under a proposal to raise the threshold to $984 per week from EPI and the Center on Budget and Policy Priorities (Bernstein and Eisenbrey 2014). Both of those proposals essentially adjust the 1975 threshold for inflation. In 2002, 2006, and 2010, the GSS included a module called the Quality of Work Life (QWL) Supplement. The QWL supplement posed the following question, “In your main job, are you salaried, paid by the hour, or what?” In 2010, the most recent year for which data are available, almost 30 (29.6) percent of workers earned less than $22,500 per year, according to the GSS (using wages fixed at 2006 levels, when the percentage in that bracket was 30.1 percent). Going up to $40,000 per year, adds another 19 percent of workers, and going up to $50,000, another 8 percent, thus encompassing 56.3 percent of all employed. The analyses in this report pooled data from the three survey years to form the largest possible sample size. Table 1, which uses the pooled GSS data for the two most recent data years, 2006 and 2010, shows that 38 percent of workers were paid on salary, 51 percent were paid on an hourly basis, and 11 percent were in the “other” category.8 The table shows for each category (salaried, hourly, and other) the share of workers in various pay brackets. Among salaried workers, 12 percent earn less than $22,500 for the year (in 2006 dollars), which equates to 4.6 percent of the total work force. Another 22 percent of salaried workers are in the next higher pay bracket, between $22,500 and $39,999. Thus, lifting the minimum salary threshold for OT pay and hours tracking to $40,000 might bring another 22 percent of the salaried work force (another 8.3 percent of the total work force) into covered status, where they gain rights to OT premium pay for their hours in excess of 40 per week (as opposed to no additional pay at all, as it stands now). Notes: Pay levels, which reflect respondents reported income from work in the previous year from working, are in 2006 dollars. The "Other" category includes independent contractors, independent consultants, and freelance workers. Shares shown may not add up to 100 percent due to rounding. It is also useful to look at what would happen if the salary threshold were raised to $60,000, because, as our later analysis will show, it is at that salary level that salaried workers do begin to enjoy greater flexibility than their hourly counterparts. With 12 percent of the salaried workforce earning between $50,000 and $59,999, raising the threshold gradually from $23,660 to $60,000 would bring an additional 51 percent of salaried workers under guaranteed OT coverage, for a total share covered of 63 percent, roughly equivalent to the share covered in 1975. Would removing the exemption of low-salary workers hurt their access to workplace flexibility? One concern regarding extending overtime protections to low-salary employees is that it might put at risk the more flexible work arrangements that some salaried workers are thought to enjoy relative to hourly employees. The fear is that requiring overtime pay for some salaried workers and thus requiring employers to keep track of the workers’ hours would effectively transform these workers into hourly status workers. They thus might lose the work-arrangement advantages or perks that may exist mainly for such salaried employees, such as not having fixed work start and stop times, or being able to leave during or before the end of the work day for family, child care, or personal reasons without losing hours of pay. However, this concern is valid only if it is true that (a) salaried workers in the lower pay brackets have substantially more such flexible work arrangements than those paid by the hour, and (b) low-paid salaried workers have similar rates of access to flexible work conditions as their relatively higher paid salaried counterparts. Thus, we address the question of whether a higher overtime salary threshold would “hurt the very people it is intended to help” by reducing the flexibility such employees have by virtue of their salaried pay status. Because the GSS respondents indicate their annual pay brackets, we will be able to determine the validity of a claim that the workers targeted for help actually have: (a) much more flexibility than hourly workers in the same pay bracket; (b) flexibility similar to that of salaried workers above the proposed higher thresholds. It is possible that that are some nuances, but we hypothesize that salaried workers would not stand to lose much flexibility, if any, even if they were shifted to hourly paid status. Table 2 shows the general ability to change one’s daily work schedule, by income bracket, for all, salaried, and hourly workers. With the exception of hourly (and “other”) workers in the $50,000 to $59,999 pay bracket, there is a clear, rather linear increase in that type of flexibility (to “sometimes” or “often” change starting and ending times) at ever-higher income levels. Notes: Pay levels, which reflect respondents reported income from work in the previous year from working, are in 2006 dollars. This table does not provide a breakdown for "Other" workers, a category which includes independent contractors, independent consultants, and freelance workers. Shares shown may not add up to 100 percent due to rounding. Table 2 also shows that indeed, the ability to change starting and ending times is higher among salaried than hourly paid workers. Among those earning less than $22,500, the proportion who have this flexibility “sometimes” or “often” is 51 percent for salaried workers and only 34 percent for hourly workers. So, indeed, considerably more low-paid salaried workers have some ability to vary the start or end times of their work day. However, in this low income bracket, both sets of such workers are currently not exempt from OT pay protection, so the gap in this range is not particularly relevant for the policy proposal to raise the guaranteed overtime pay threshold. More relevant is the gap among workers in pay brackets affected by an increase in the OT threshold. If the OT pay threshold increases to $50,000, salaried workers in the $40,000 to $49,999 pay range who now enjoy a 55 percent start-and-end flexibility rate could experience up to an 11 percentage-point drop in that rate, down to 44 percent (see the third data rows in the bottom two panels in the table). 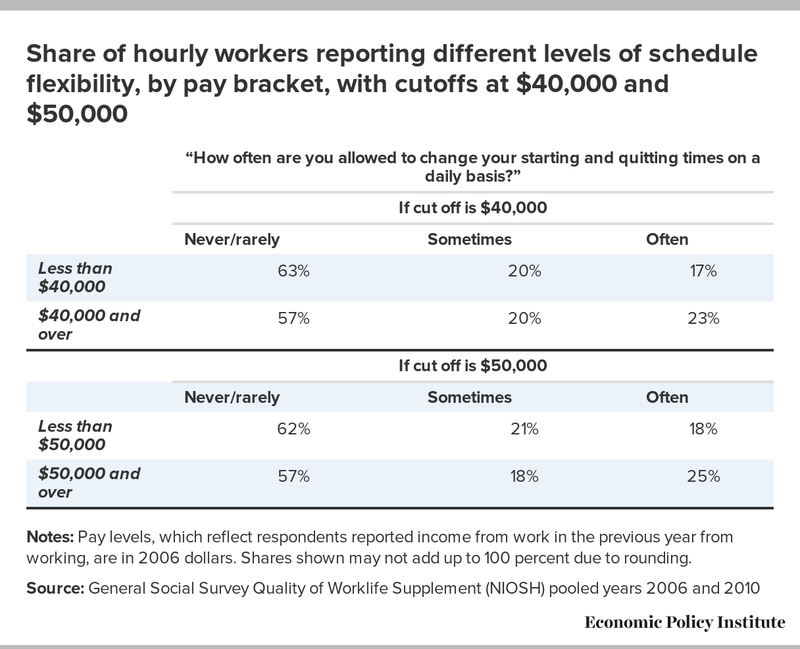 As just noted, 51 percent of salaried workers making below $22,500 have daily work schedule flexibility on either an “often” or “sometimes” basis. For those between $22,500 and $39,999, the share rises slightly, to 53 percent, and for those between $40,000 and $49,000 it rises only to 55 percent. Thus, the difference among such workers is quite trivial. Notes: Pay levels, which reflect respondents reported income from work in the previous year from working, are in 2006 dollars. Shares shown may not add up to 100 percent due to rounding. Table 3 shows that hourly workers gain flexibility as they earn more. When using $40,000 as the income divide, there is about a 6 percentage-point difference between the rate of hourly workers below that divide who say they can “often” vary their starting and ending times and the rate of frequent flexibility of those above the threshold. This difference is similar in magnitude for those under and over $50,000. In addition, as Table 2 showed, it is the salaried workers much higher up the pay distribution who have a lot more flexibility to vary their start and end times. Thus, raising the exemption threshold up to but not beyond $50,000 is unlikely to markedly reduce flexibility for the newly covered workers, since it is the higher salaried workers who have the greatest flexibility to schedule the starting and ending times of their work days. Having an ability to take time off during a work day, to attend to personal or family matters, is a crucial source of well-being for many workers (Golden, Henly, and Lambert 2013). Thus, it would be detrimental to workers if moving them effectively from salaried to hourly work lessened their flexibility in this regard. Table 4 shows, demonstrably, that there is no significant pattern of flexibility to take time off across income groups. Actually, salaried workers earning less than $22,500 annually have slightly less flexibility than their hourly counterparts (66 percent say it is “not too hard” or “not at all hard” to take time off, versus 72 percent of the lowest-paid hourly workers). The flexibility levels of salaried and hourly workers in the two pay brackets above $22,500 are very similar. Thus, extending OT coverage to salaried workers making more than $22,500 would not affect flexibility of taking time off. Interestingly, the lowest-paid salaried workers, who are currently covered by the OT law, have a somewhat greater difficulty finding time to take off during the work day than not only hourly workers in the same pay bracket (as noted above) but also than higher-paid salaried workers. About two-thirds of the national General Social Survey QWL sample work at least one day per month “beyond usual hours,” to which we refer here as “overtime.” Overtime work may be considered an indicator of inflexibility when such work is mandatory, required by the employer. 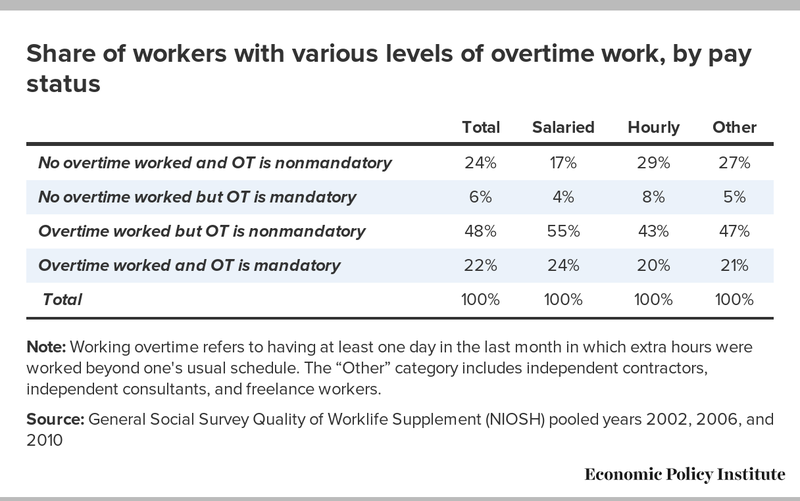 Table 5 presents the findings regarding overtime work, how much of it is regarded as required or mandatory, and how levels of mandatory OT differ for salaried and hourly workers. It shows that a virtually identical rate of 28 percent of both hourly and salaried workers consider their overtime work to be mandatory (data rows two and four in Table 5 together show, regardless of whether overtime was actually worked, if it is considered mandatory when it is required). In contrast, 72 percent of overtime work can be considered “voluntary.” Thus almost three in 10 workers lack the flexibility to refuse such extended work hours, or feel that refusal is not a realistic option, perhaps even subject to some reprisal or reprimand. As far as actually working overtime (mandatory or not), the proportion of salaried workers who do so (79 percent) substantially exceeds that of hourly workers (63 percent).12 Moreover, 24 percent of salaried workers actually worked some mandatory overtime in the previous month, a slightly higher rate than among hourly workers (20 percent). Thus, it is conceivable that shifting salaried workers to hourly paid status at the relatively lower income levels affected under proposals to raise the OT threshold would not deprive any more workers of the flexibility to refuse or avoid mandatory overtime work. Note: Working overtime refers to having at least one day in the last month in which extra hours were worked beyond one's usual schedule. The “Other” category includes independent contractors, independent consultants, and freelance workers. Table 6 also shows that while nonmandatory overtime work among salaried workers increases at ever higher levels of pay, the compulsoriness of overtime work does not show such a steady increase. For salaried workers earning below the $22,500 level, the share working mandatory overtime is 25 percent, compared with 18 percent of hourly workers. If those employed in the $22,500 to $39,999 range switched from salaried to hourly status, their risk of incurring mandatory overtime work would diminish slightly—from 22 percent to 20 percent. However, the likelihood that overtime work is mandatory is particularly prevalent in the $40,000 to $49,999 pay bracket for salaried workers (also a bit for hourly workers, but not nearly to the degree). In the $40,000 to $49,999 bracket, the proportion of salaried workers with mandatory overtime rises to 35 percent, while the proportion of hourly workers with mandatory overtime rises to only 22 percent. Thus, these data suggest that shifting salaried workers to effectively hourly paid status, in the two pay brackets above the current threshold level, would not deprive them of the flexibility to refuse or avoid mandatory overtime work. Indeed, if the higher pay threshold were adopted, workers are more likely to “gain” some flexibility to refuse overtime work. Notes: Pay levels, which reflect respondents reported income from work in the previous year from working, are in 2006 dollars. Working overtime refers to having at least one day in the last month in which extra hours were worked beyond one's usual schedule. 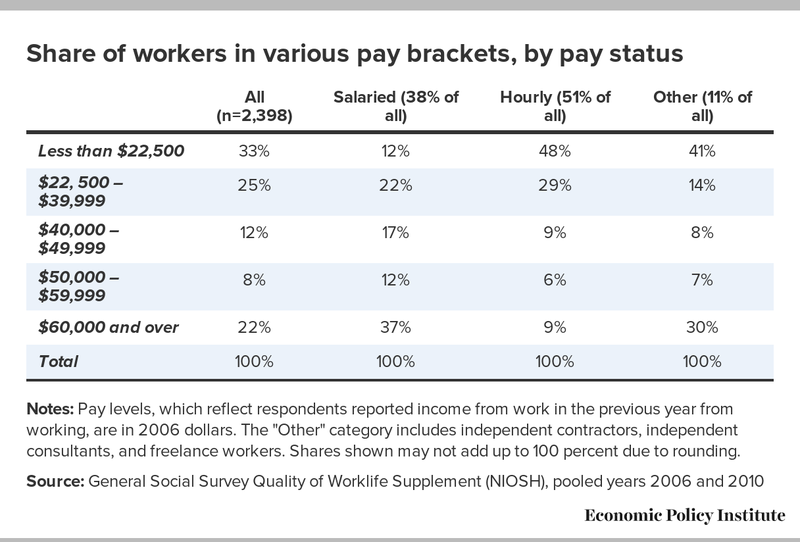 In this table, “Other” workers, who include independent contractors, consultants, and freelance workers, are included in the hourly workers' figures given their similarity in flexibility to hourly workers. Shares shown may not add up to 100 percent due to rounding. In our analysis, we reverse-scored the actual responses. So in our scores, for work-life conflict, 1= never, 2= rarely, 3=sometimes and 4= often; and for work stress 1=never, 2=hardly ever, 3=sometimes, 4=often, and 5=always. Table 7 displays the average of all workers’ reported levels of work-family conflict and work stress, by shift type. For work-family conflict, the reported levels are between “sometimes” and “rarely,” which is not too surprising, given that many of the employed do not necessarily have children present in the household. Work stress, on average, occurs “sometimes.” Working irregular shift times (which includes on-call shift times) does increase (statistically significantly) work-family conflict; however, work stress is even across types of work shifts. ***p<.001 in t-test. 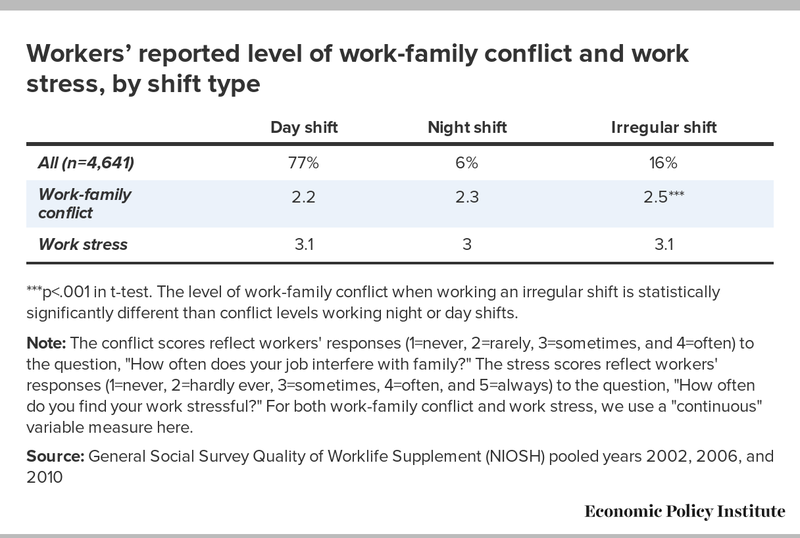 The level of work-family conflict when working an irregular shift is statistically significantly different than conflict levels working night or day shifts. Note: The conflict scores reflect workers' responses (1=never, 2=rarely, 3=sometimes, and 4=often) to the question, "How often does your job interfere with family?" The stress scores reflect workers' responses (1=never, 2=hardly ever, 3=sometimes, 4=often, and 5=always) to the question, "How often do you find your work stressful?" For both work-family conflict and work stress, we use a "continuous" variable measure here. ***p<.001 in t-test. Salaried workers with irregular shifts have more conflict than salaried workers with day and night shifts and the difference is statistically significant. For hourly workers, those with irregular and night shifts have work stress levels that are statistically significantly different from one another and from day shift workers. Notes: The conflict scores reflect workers' responses (1 = never, 2 = rarely, 3 = sometimes and 4 = often) to the question, "How often does job your interfere with family?" The “Other” category includes people working as independent contractors, independent consultants, or freelance workers. Shares shown may not add up to 100 percent due to rounding. Would changing work status from salaried to hourly in the pay brackets above the already covered low-pay bracket affect the work stress or work-family conflict experienced by those in these brackets? While we do not break out conflict levels by pay bracket, as stated above, Table 8 suggests that, if anything, because the salaried work force starts out with higher work-family conflict, a reclassification as hourly might slightly reduce their work family conflict. Table 8 showed that working on irregular shift times exacerbates feelings of work-family conflict. 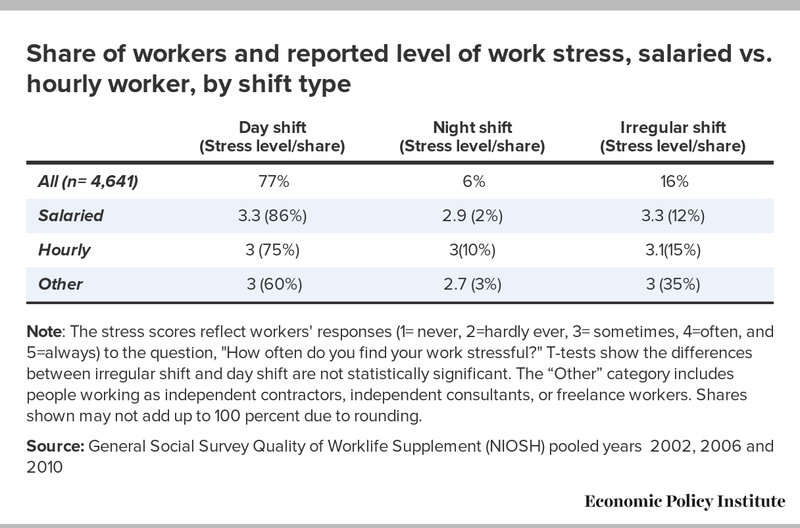 Table 9 shows that working irregular shift times, however, is not associated with greater work stress. However, salaried workers on irregular schedules exhibit slightly higher work stress than hourly workers. Also, the levels of work stress are slightly higher among salaried than hourly workers (and higher than those in the “other” category). Note: The stress scores reflect workers' responses (1= never, 2=hardly ever, 3= sometimes, 4=often, and 5=always) to the question, "How often do you find your work stressful?" T-tests show the differences between irregular shift and day shift are not statistically significant. The “Other” category includes people working as independent contractors, independent consultants, or freelance workers. Shares shown may not add up to 100 percent due to rounding. Table 10, which breaks out shift types by pay status and pay level, shows that hourly workers in the currently covered lowest pay bracket are twice as likely to be on irregular shift times (and also more than twice as likely to work the “night shift”) as are salaried workers in the same low pay bracket. 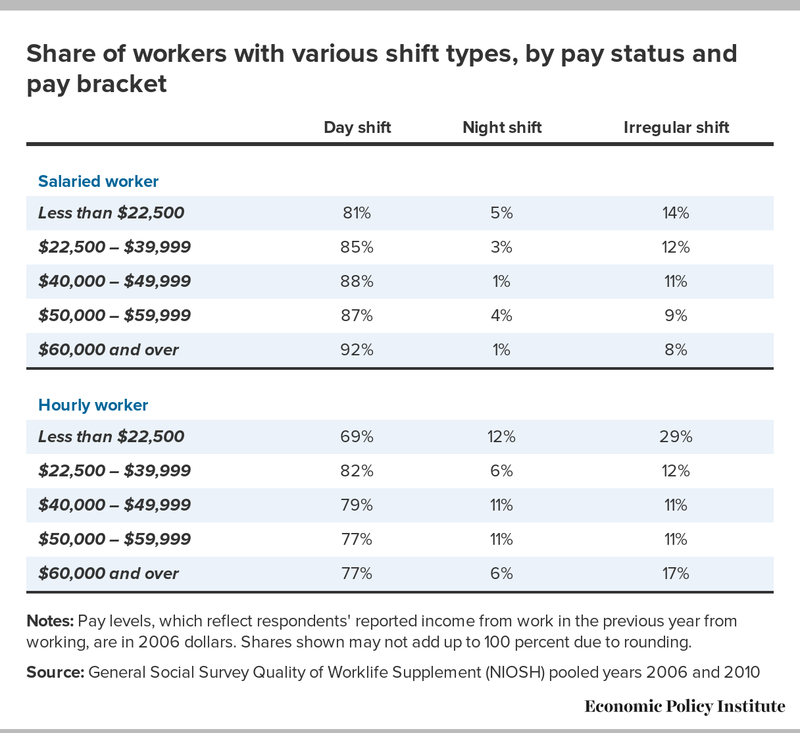 However, at the two pay levels just above the lowest, the share of hourly workers with irregular shift times is virtually identical to the share of salaried workers with irregular shifts, while at the next pay bracket above that ($50,000 to $59,999) the differences are only slight. This suggests that transforming salaried into new hourly workers does not threaten to make their schedules any more irregular than they are now. Notes: Pay levels, which reflect respondents' reported income from work in the previous year from working, are in 2006 dollars. Shares shown may not add up to 100 percent due to rounding. 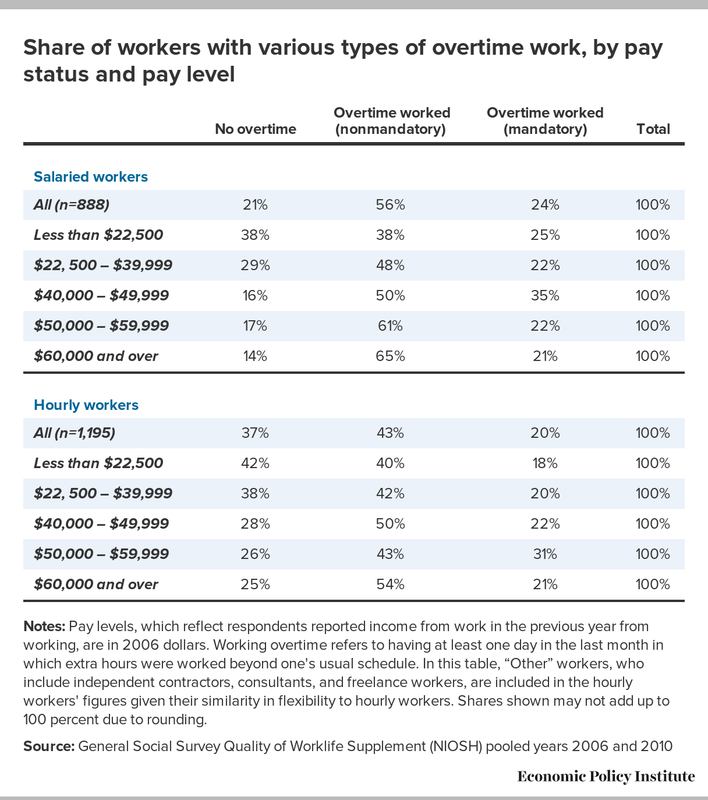 Table 11 depicts the association between overtime work, its apparent voluntariness, and outcomes. As with Tables 5 and 6 earlier, it also suggests that if salaried workers were changed to hourly status, there would be no increase in their risk of facing mandatory overtime work, thus, not losing any meaningful degree of flexibility. If anything, the outcomes (work-family conflict and work stress) associated with mandatory overtime might improve and would surely get no worse if such workers were paid by the hour and eligible for an overtime premium. Table 11 shows that working more days of overtime increases both work stress and work-family conflict, not surprisingly. Indeed, generally the degrees of both work stress and work-family conflict increase gradually from no overtime work to overtime work. However, when extra work is mandatory, this further heightens the work-family conflict and work stress for hourly but not salaried workers. 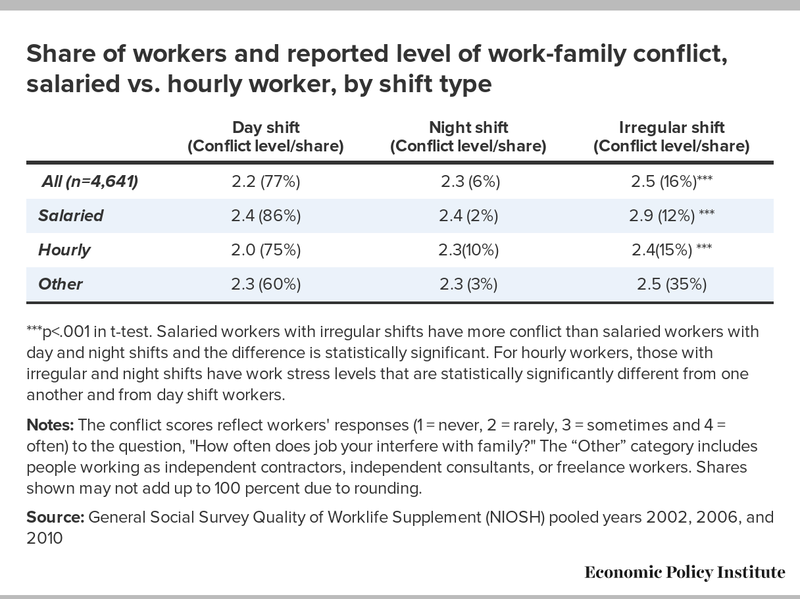 For work-family conflict, the gradient of increase is evident for both salaried and hourly workers. Moreover, work-family conflict is the highest among salaried workers with mandatory overtime work. Thus, taking tables 10 and 11 together, changing salaried workers to de facto hourly work status by raising the overtime pay threshold to cover all three lowest income brackets likely would not worsen employees’ work stress or work-family conflict; indeed, it may slightly reduce their work-family conflict incurred from extra work hours. *** p<.001 in t-test. Overtime work that is mandatory is associated with greater work-family conflict, for both salaried and hourly workers, as compared to having either voluntary overtime or no overtime work. In addition, for both salaried and hourly workers, the reported level of work-family conflict is higher when overtime is mandatory than when not mandatory. Work stress is higher for workers with overtime work generally, regardless of whether it is mandatory or voluntary. 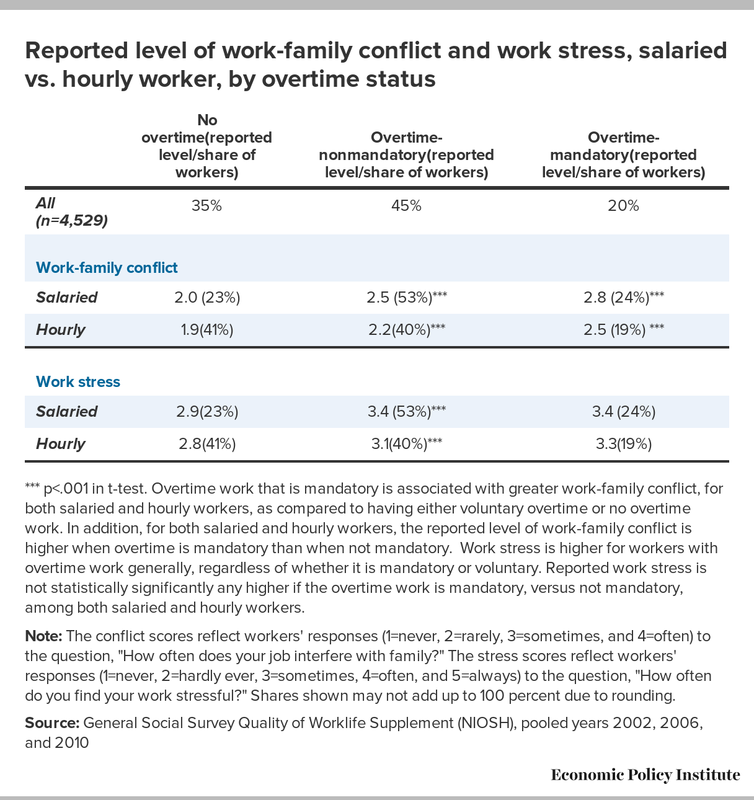 Reported work stress is not statistically significantly any higher if the overtime work is mandatory, versus not mandatory, among both salaried and hourly workers. Note: The conflict scores reflect workers' responses (1=never, 2=rarely, 3=sometimes, and 4=often) to the question, "How often does your job interfere with family?" The stress scores reflect workers' responses (1=never, 2=hardly ever, 3=sometimes, 4=often, and 5=always) to the question, "How often do you find your work stressful?" Shares shown may not add up to 100 percent due to rounding. The nationally representative findings from the GSS may be buttressed by an industry-representative case study of about 100 low- to mid-level managers from 80 stores of a national women’s apparel retailer, located in the Northeast and Middle Atlantic regions.15 Because their annualized salaries are at least $33,000 and go up to $65,000, with a median and mean of about $45,000 a year, they are similar in pay level to workers that would be affected by an increase in the guaranteed overtime pay threshold. Data are from the entire year of 2012. In slightly over 50 percent of the weeks in the year, these store managers worked at least one hour over 40 hours in the week. However, in 16 percent of the weeks, they worked a substantial number of overtime hours, five or more hours over 40. Moreover, of those who worked at least one hour over 40 hours, the median extra hours worked was about 1¼ hours per week, and the mean was a greater 3¼ hours extra. This is because the minimum hours worked over 40 was about half an hour but the maximum was almost 12 hours. Thus, the typical “manager” in such a position (only one per store), not only often put in a nontrivial number of hours beyond the norm of 40 hours, but additional hours that are entirely “unpaid.” This group would be typical of those who stand to benefit most from an upward adjustment of the salary threshold for guaranteed overtime pay. In addition, groups such as store managers are sufficiently insignificant in size and scope so as to not unduly financially burden most employers, particularly large ones. However, it is possible that at least some employers might make some adjustments in their allocation of labor. What is the extent to which the regulatory rule change raising the overtime pay threshold will lead employers to perhaps eventually lower the base wage of workers whom they expect to work overtime? While lowering base pay means that the premium pay workers might have received is eventually at least partly offset, with lower hourly pay rates, this would likely preclude employers from responding by hiring fewer workers at straight-time rates, another concern of those debating changes to OT regulations. We may also reasonably speculate that in the event an employer does curb or eliminate OT hours, much of the supervisors’ work would be shifted to hourly workers. However, this may be viewed as a win-win, since involuntary part-time employment remains stubbornly high. For example, in the clothing stores case, about 50 percent of hourly workers indicated being underemployed, eager to pick up more work hours, in part because supervisors do much of the sales associates’ work tasks anyway while at the stores. The intention of the FLSA overtime pay penalty has always been twofold. One, imposing a penalty that employers pay for overtime work discourages employers from demanding long hours of individual employees, which protects workers from being forced to work extended hours, often spilling into evenings and weekends (Hamermesh 2014). Imposing a penalty on employers for overtime work also creates an incentive for employers to “spread” work by hiring more workers, which reduces unemployment and/or underemployment, although not necessarily proportionally or directly. The evidence is convincing that these laws are effective in inducing employers to avoid scheduling long workdays (Hamermesh 2014; Costa 2000; Askenazy 2013; Hamermesh and Trejo 2000; Hart and Ma 2010, 2013; Trejo 2003). Because the timing of work, particularly extra work, matters to employees and not just employers, employers might gain from operating businesses at night and/or on the weekend, creating a demand for workers at what might be unusual work times, whereas employees might prefer more regular, daytime, weekday shifts. Thus, many other countries have legislated penalty pay rates, independent of the number of overtime hours, for work or shifts timed on weekends or at nights. For example, in Portugal, work during weekday nights is penalized at a 25 percent rate, and a much higher rate during weekend nights (Hamermesh 2014). Not surprisingly, the extra cost to employers of operating at night or on weekends from these penalties does induce employers to shift at least some of the demand for labor away from these “unsocial” times to more standard times (Cardoso, Hamermesh, and Varejao 2012). Thus, by analogy, if employees currently on a salary in the U.S. are made no longer exempt, then it is likely that employers will require less work that spills over into nonstandard work times of the day or week, making such workers better off, on balance.16 Indeed, there is evidence that in at least two countries, when hours of work were cut exogenously by policy, employers responded to this overtime penalty by scheduling fewer weekly hours per worker, which in turn was associated with higher life satisfaction or happiness among the workers targeted by the policy (Hamermesh et al. 2014). The effects of the FLSA overtime pay regulation on employers’ decisions to adjust either wage rates, hours, or employment were studied using employer compensation data from industries, which included the role of fixed labor costs (Barkume 2010; Trejo 1991). Using quasi-fixed employment costs as independent variables allows for a better accounting of labor demand; lower wages go hand-in-hand with jobs requiring more overtime work. This suggests that overtime pay regulation influences the structure of compensation. Thus, jobs that require more overtime hours of work are jobs that also have a higher ratio of fixed employment costs to wage rates. It appears that eventually employers adjust wage rates downward, thus partly preventing higher average labor costs for employers. This in turn ought to preclude any downward adjustment of employment as a result of requiring overtime pay for the overtime work hours of newly covered employees. In Japan, the title “in-name-only” store manager refers to an employee who has essentially the same job description as other employees, but is designated to be exempt from overtime pay regulations and ineligible for the overtime premium of at least 25 percent for hours worked beyond the statutory work hours. Longitudinal data on employees found that in-name-only managers, exempted from overtime regulations, worked longer average hours than nonexempt employees, at least among those without a college degree and mainly in the services, wholesale/retail, and hospitality sectors (Kuroda and Yamamoto 2012). The effective hourly wages of in-name-only managers were no lower than wages of other employees when controlling for employee characteristics. Thus, in-name-only managers’ base salaries rose to make up for their loss or absence of overtime pay. This suggests that legislation that incorporates more such salaried workers into the nonexempt work force might somewhat restrain their hours of work without increasing employers’ labor costs or wage payments to the workers. Previous research showed that U.S. employers eventually adjust base salaries downward or upward to accommodate the adding or removing of the overtime pay premium, at least in the longer run. Importantly, employees are likely to wind up with fewer hours and higher income because employers’ adjustments are likely to be incomplete. Thus, the net result of the new proposed regulation for affected workers would likely be shorter average work hours at the same if not higher take home pay. Support for this can be found in a natural experiment created in 1999, when California extended overtime coverage to white-collar workers with salaries between $250 and $460 per week. Research has analyzed the effect of California’s more extensive coverage on the likelihood of working overtime and the actual number of overtime hours worked, and found that overtime coverage reduces the probability of working overtime by over 18 percent, presumably reflecting the labor-demand side response (Mitchell 2005). However, the behavior of overtime hours might also be consistent with a model in which workers and firms adjust hourly wage rates downward, to negate the effects of overtime regulations, because the total number of overtime hours did not increase.17 Indeed, in this California example, there is evidence that firms increased the hours of types of labor not covered by the regulation. By implication, this suggests that employers’ labor costs would not rise, on balance, and thus hiring would not be impaired, and newly covered workers would no longer have unpaid extra work hours. In sum, there is little long-term risk that boosting the overtime pay premium threshold would undermine job creation or hurt those workers intended to be helped. Lonnie Golden is a professor of economics and labor-employment relations at Penn State University, Abington College. He holds a Ph.D. in economics from the University of Illinois-Urbana. His research has centered on the labor market and hours of work—specifically the economic and non-economic determinants of hours, including legal, organizational, and individual preferences, and their effects on well-being, including work-life and worker happiness, and the level of employment. He is co-editor of the books, Working Time: International Trends, Theory and Policy Perspectives (Routledge Press) and Nonstandard Work: The Nature and Challenge of Changing Employment Arrangements (Cornell University Press). The author would like to thank Jaeseung Kim for his valuable research assistance, and Julia Henly, Susan Lambert, and Alexandra Stanczyk for sharing data from the University of Chicago Work Scheduling Study (WSS). Askenazy, Philippe. 2013. “Working Time Regulation in France from 1996 to 2012.” Cambridge Journal of Economics, vol. 37, no. 2. Barkume, Anthony. 2010. “The Structure of Labor Costs with Overtime Work in U.S. Jobs.” Industrial and Labor Relations Review, vol. 64, no. 1, 128–142. Cardoso, Ana Rute, Daniel S. Hamermesh, and Jose Varejão. 2012. “The Timing of Labor Demand.” Annals of Economics and Statistics, no. 105–106. Costa, Dora L. 2000. “Hours of Work and the Fair Labor Standards Act: A Study of Retail and Wholesale Trade, 1938-1950.” Industrial and Labor Relations Review, vol. 53, no. 4, 648–664. Duke, Brendan V. 2014. America’s Incredible Shrinking Overtime Rights Need an Update. Center for American Progress. Golden, Lonnie, Julia Henly, and Susan Lambert. 2013. “Work Schedule Flexibility: A Contributor to Happiness?” Journal of Social Research & Policy, vol. 4, no. 2. Hamermesh, Daniel. 2002. “12 Million Salaried Workers Are Missing.” Industrial and Labor Relations Review, vol. 55, no. 4. Hamermesh, Daniel S., Daiji Kawaguchi, and Jungmin Lee. 2014. Does Labor Legislation Benefit Workers? Well-Being after an Hours Reduction. IZA Discussion Paper No. 8077 (2014). Hamermesh, Daniel S., and Stephen Trejo. 2000. “The Demand for Hours of Labor: Direct Evidence from California.” Review of Economics and Statistics, vol. 82, no. 1, 38–47. Hart, Robert, and Yue Ma. 2010. “Wage-hours Contracts, Overtime Working and Premium Pay. Labour Economics, 17, 170–179. Henly, Julia R., and Susan Lambert. 2014. “Unpredictable Work Timing in Retail Jobs: Implications for Employee Work-life Outcomes.” Industrial and Labor Relations Review, vol. 67, no. 3, 986–1016. Kuroda, Sachiko, and Isamu Yamamoto. 2012. “Impact of Overtime Regulations on Wages and Work Hours.” Journal of the Japanese and International Economies, vol. 26, issue 2, 249–262. Lambert, Susan J., Peter J. Fugiel, and Julia R. Henly. 2014. Precarious Work Schedules among Early-Career Employees in the U.S.: A National Snapshot. University of Chicago. Lambert, Susan J., and Julia R. Henly. 2010. Managers’ Strategies for Balancing Business Requirements with Employee Needs. Report of the University of Chicago Work Scheduling Study. Mayer, Gerald. 2004. The “White-Collar” Exemptions to Overtime Pay Under Current and Proposed Regulations: An Economic Analysis.” Federal Publications: 181. Mitchell, Joshua. 2005. Forecasting the Effects of the August 23rd Fair Labor Standards Act Overtime Changes: Evidence from a California Natural Experiment. Department of Economics, Stanford University. Trejo, S.J. 1991. “The Effects of Overtime Pay Regulation on Worker Compensation.” American Economic Review, vol. 81, no. 4, 719–740. Trejo, S.J. 2003. Does the Statutory Overtime Premium Discourage Long Workweeks?” Industrial and Labor Relations Review, vol. 56, no. 3, 530–551. 1. The GSS started in 1972 and completed its 27th round in 2008. For the last third of a century the GSS has been monitoring societal change and the growing complexity of American society. The GSS is the largest project funded by the Sociology Program of the National Science Foundation (NSF). The Quality of Worklife Supplement grew out of an interagency agreement between the NSF and the National Institute for Occupational Safety and Health (NIOSH). 2. “Proposal to Limit White-Collar Overtime Exemption Expected in November, DOL Says,” Bloomberg BNA (subscription online report from The Bureau of National Affairs), June 2, 2014. 3. U.S. Department of Labor Unified Agenda, May 23, 2014. 5. The bill also raises and then indexes the minimum annual pay rate to be considered exempt regardless of duties, as a “highly compensated employee,” which is currently affixed at $100,000 per year. 6. U.S. Senate Committee on Health, Education, Labor and Pensions, “Harkin, Eight Senate Democrats Introduce Bill to Restore Overtime Protections for American Workers,” press release, June 18, 2014. According to another estimate, guaranteed overtime rights have fallen to only 18 percent of full-time salaried workers (Duke, 2014). 7. The GSS income brackets allow us to compare those workers earning below and above either $40,000 or $50,000 per year, quite close to the discussed regulatory and legislative cutoff points, respectively. They also permit comparison to brackets in the categories above that, $50,000 to $59,999, $60,000 to $74,999, $75000 to $89,999, $90,000 to $109,999, and $110,000 or over, although for the latter two the sample sizes get noticeably smaller and for the year 2002, the income brackets are slightly different. 8. While most “salaried” workers are employed full time, 37 percent are employed part time. 9. In addition, the table reveals that the “other” category (amounting to about 11 percent of the work force), which consists largely of independent contractors and temporary workers, more closely resembles hourly than salaried workers. 10. For the data on labor income, we use only the 2010 and 2006 data, pooled, because the income levels changed. The income levels are in 2006 dollars. 12. “Other” workers, who include independent contractors, consultants, and freelance workers, are very similar, and thus were combined with hourly workers for the mandatory overtime question, and elsewhere are not examined in depth, given their similarity in flexibility to hourly workers. 13. There is a segment of the work force willing to work extra hours for no extra pay, but it is tiny. In addition, if there remains a demand for extra work hours, these hours could conceivably be made available to underemployed workers (Delaney 2014). 14. Hourly workers on the night shift have more work-family conflict than hourly workers on the day shift. 16. At the very least, it justifies imposition of minimum pay as a penalty for using minimum hours of pay for irregular shift work, on-call work, and working in split shifts that spill into nontraditional work day times (see Lambert, Fugiel, and Henly 2014: Henly and Lambert, 2014). 17. Mitchell argues this may prove to be somewhat regressive, if incomes were reduced for those whose earnings fall in the relatively lower pay levels.